Organise! and the WSM picketed Starbucks in Belfast city centre today from 12 to 1 pm. Despite the miserable weather around 12 people joined the picket and leafleted passers by and potential customers outside the coffee shop. At the start of the picket 3 people had gone inside to leaflet customers and staff. There was a very positive response to the picket however one person was falsely accused of assaulting a Starbuck's member of staff after leafleting staff and customers inside. As part of the Global Day of Action against Starbucks called by the AIT/IWA and IWW Organise! 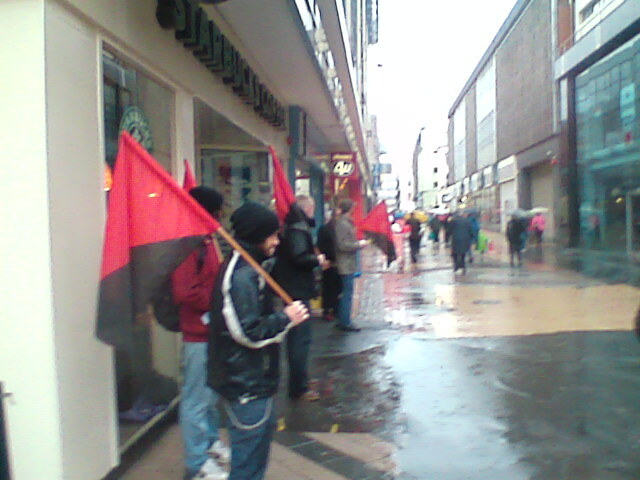 and the WSM picketed Starbucks in Belfast today (5th July) to demand the reinstatement of Monica, a member of the anarcho-syndicalist member working in their central Seville outlet, and Cole Dorsey, an IWW member who was fired by Starbucks for organising in their Grand Rapids, Michican, shop. Organise! and the WSM picketed Starbucks in Belfast city centre today from 12 to 1 pm. Despite the miserable weather around 12 people joined the picket and leafleted passers by and potential customers outside the coffee shop. At the start of the picket 3 people had gone inside to leaflet customers and staff. There was a very positive response to the picket however one person was falsely accused of assaulting a Starbuck's member of staff after leafleting staff and customers inside. While Starbucks present themselves as a trendy, ethical corporation when it comes to their own workers they are ruthless union-busters determined to stop their employees organising. Monica was fired on the 24th of April without notice. She had worked in the central Seville branch of Starbucks for a year and a half when her manager suddenly claimed she "created problems with her workmates". She had resistged management when they made people work public holidays without extra pay. She refused to attend work meetings outside working hours where no pay or time in lieu was offered. Her sacking came after she asked about another worker who had ben fired. The store manager had told her on several occassions that she must have nothing to do with unions. Barely a month later, in Grand Rapids, Michican, USA, Starbucks fired Cole Dorsey on June 6th. Cole had over two years of service and was active in the IWW Starbucks Workers Union.